College basketball as you know it? It’s over. That sport doesn’t exist anymore, because that sport had a semblance of parity. One year North Carolina is the dominant program. One year it’s UConn. One year it’s Duke or UCLA or Florida. Maybe those teams don’t win the national title the year they’re dominant, or maybe they do. Either way, every year there is a team that, on paper, is the dominant program in college basketball. And every year it’s a different team. Until now. Until John Calipari merges with Kentucky. Don’t get me wrong. I think Calipari will be great at Kentucky. Do I think he’ll win a title? It’s probably a good bet. Multiple titles? Not out of the realm of possibility, either. What I don’t believe is that college basketball as we currently know it is over because John Calipari is reportedly the new coach at UK. Maybe I missed something, but Roy Williams is still loading up at North Carolina, Rick Pitino is still in charge at Louisville, Tom Izzo is still getting to the Final Four in East Lansing and Tom Crean is just getting started in Bloomington. Sure, it’s a scary thought when you combine a top-notch recruiter like Calipari with the facilities, fanbase and tradition that exist in Lexington. 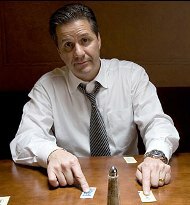 If Calipari keeps his nose out of the dirt and wins big, it’s a match made in heaven. The hunger to win for a rabid fanbase that hasn’t been to a Final Four since 1998 will be satisfied. But there’s also the other side of the coin: awful graduation rates, a possible lack of discipline, a vacated Final Four appearance at UMass and of course, William Wesley. So before we go anointing a dynasty in Lexington, let’s let this all play out … shall we, Mr. Doyel? The last time an Italian was hired to lead a bunch of rowdy inbreds to the promise land it was Ceaser and the Romans and how did that work out? You guys get one my nervs with this stuff. I mean you guys don’t have a clean record enymore do you? The worst thing IU ever did was show Knight the door. I live in Indiania southern by the way frome Kentucky and proude of it. I have great respect for the Hoosiers not all Kentucky fans are the same but one thing im tired of is hearing you guys say Kentucky cheats. It happend in the past we have moved on. IU will be a great programe in a few years! But one thing I will say no matter how bad are team is RUPP WAS ALWAYS FILLED no matter can you guys say the same nope! So get over and get of our backs good luck next year you will need it GO BIG BLUE! Hopefully this ends up much worse for them. I would sacrifice my left arm for Demarcus Cousins, but they are as good as gone to Kentucky. take this from someone who has seen this stuff first hand. cal is as dirty and smart as they come. he knows how to not get caught and how to get his players the things they want. i got so sick and tired of seeing these guys roll around town in their new cars. In memphis cal didn't have the media attention he will at kentucky and if he tries the same things with his friends of the program like mr. west he will be caught a lot quicker than he thinks. Alex, your suspicions of Coach Cal would be more convincing if it wasn’t clear that most IU fans are simply sick at the thought of UK becoming a monster program again. UK dominated IU even during its long decline over the last decade, so imagine what will happen now with Cal signing top recruiting classes and IU begging student managers to put on the candy-stripe pants. 1st with 2000 wins' T-shirts.